Bare-root roses are dormant, sold during winter and early spring. Plant them as soon as the ground warms enough to be workable. Pre-packaged roses are bare-root plants packaged in a bag or box with a moisture retaining medium such as sawdust around the roots. Container-grown roses are grown in containers at the nursery. They're budding or already blooming and are available in spring. Roses can be further defined by their growing type. Budded or grafted roses is one type, meaning that one variety of rose is grafted onto the roots of a sturdier more vigorous variety, but doesn't have a desirable bloom. Upon examination, the grafting is visible at the bud union which is just above the soil line. 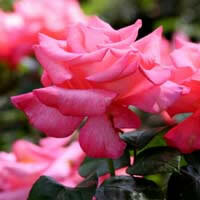 Grafted roses combine the strong root qualities of one plant with the foliage and blooms of the grafted variety. Roses are also grown on their own roots. Own-root plants are grown from cuttings so the entire plant is of the same variety. If a grafted rose is heavily pruned or cold-damaged, the rose that grows back may be of the rootstock's variety, not the more desirable grafted one. Under the same circumstances, the own-root rose will grow back true to its variety. Dig a slightly larger hole than the pot size or root system of the rose bush. Add bone meal to the planting hole (about a small handful). Add a little compost or peat moss to the excavated soil to loosen it up a big. Remove the rose from the pot, unless it's growing in a bio-degradable carton. Carefully place in the hole and shovel the extra soil around the new plant. Plant the rose with the crown slightly deeper than the original soil. The crown or bud union should be about 1" under the soil. Gently firm the rose into its new home and water well. NEVER fertilize a new rose bush with anything other than bone meal. Some rose growers will argue about planting depths for roses. The correct planting depth depends on your climate. As a general guide in Zones 5 - 6, plant so that the union is about 1" below ground level. For Zones 7-8, plant so that the crown is ground level. For Zones 9 - 10, plant about 1" above ground level. For bare-root plants: Soak bare-root rose plants overnight in a bucket of tepid water before planting (to re hydrate them). Trim off root section that appear broken. Dig the hole as described above. Carefully deposit some dirt in the center of the hole to create a cone shape that rises about 1/2 way up the hole's depth. Place the bare roots over the cone and spread them out. As you steady the bare root plant, fill in the remainder of the and water in as described above. Then mound soil over the crown to protect the new shoots while the roots become established. Over a period of 3-4 weeks, gradually reduce the mound to the correct soil level for your area (use a stream of water to remove the soil mound). Factors such as the soil type, how big the plant is, how fast the plant is growing, air temperature, humidity, wind and light intensity all will affect how often a particular plant will need watering. The basic rule is to water infrequently, but deeply. Get the water down a minimum of 10 " at each watering. This encourages the plant to develop a deep, drought tolerant root system. Allow the soil to dry between watering. It's common to kill or stress their plants by watering too often. Rose roots require oxygen. If the soil is constantly soaked, there is not enough oxygen and the roots suffocate and die. To water deeply build a basin around the rose plant. It should be wide enough to accommodate the root system of the plant (generally out to the drip line of the plant) and high enough to hold 2" — 3" of water when full. Fill the basin, let it soak in, and fill it again. Don't water the plant again until the soil dries out. Water early in the day if possible so that water splashed on the leaves can dry before the cool evening.